Honest minds know that the best high school football in Michigan is played in the Grand Rapids-Muskegon area. It will be apparent again Thursday and Friday as this season kicks off with some East vs. West games. Predicted winners are bold. Canton @ West Ottawa: WO dropped this opener last year, but home field could be the edge here. Detroit Catholic Central @ Muskegon: If CC, now in Novi, moves much more West, it will be in our coverage area someday. Two of the state’s legendary programs meet, and blue collar trumps Oakland County suburbs. Detroit Country Day @ Zeeland West: Just like last year, Zeeland West will be too strong, too fast for Chris Webber’s alma mater. Detroit Loyola @ Zeeland East: Loyola may only be Division 7, but the Bulldogs are two-time state runners-up at that level. Muskegon Mona Shores @ Saline: Saline has one of the state’s top defensive backs in Tyrone Miller, who has offers from half the MAC. He’ll see first-hand a guy who will be one of the top QB’s in the league in a few years, Mona’s/Buffalo’s Tyree Jackson. Utica Eisenhower @ Rockford: The Rams won this one last year at Ike, too. Muskegon has played in two straight state title games and don’t be surprised if there’s another thanks in no small part to the Big Reds veteran offensive line, including a couple of D1 prospects in the junior class Juanye Johnosn and Dereices Brown. They’ll be blocking for a new quarterback with Deshuan Thrower having matriculated to college basketball, but top running back Caleb Washington and receiver Joeviair Kennedy are both back. Linebacker TJ Smith is the top returning tackler and Alezay Coleman holds down the defensive backfield. They’ll have even more responsibility and be tested without Kenneth Finley up front. The Mona Shores games could be interesting, but other than that Muskegon won’t be tested in the O-K Black — which is saying something because it’s not a weak league at all with four playoff teams in 2013. The non-conference schedule is a diffent story, as it includes Detroit Catholic Central, Grand Rapids Christian and East Grand Rapids. This is simply one of the state’s elite programs, operating at full capacity under a hall of fame coach. If their season holds to form, they’ll embarrass Detroit Country Day Thursday before rolling the O-K Green, with an intriguing out-of-league respite at Comstock Park. Despite graduating the Lake Area’s best tight end and running back, Jordan VanDort and Danny Bauder, respectively, coach John Shilito’s defending Division 3 state champion will again contend. The offensive line is veteran and athletic, with the top returning lineman, senior Trevor Raby, moving to tight end. Senior Smith Saenbouttarath is the Dux top two-way lineman. Junior Casey Brinks returns at QB. He handled the ball in the wing T deftly as an underclassman. The big-break backs this fall are senior Nick Jasch who has 4.6 speed and junior Dakota Geurink. Junior linebacker Zach VanValkenburg is one of the Lake Area’s top college prospects in the 2016 class. The Rams’ defense carried them to a fifth-straight O-K Red crown (5-0) in 2013 despite numerous injuries. Brent Showers and Randy Garvin are gone so the onus will switch to the offense. Rockford will as always be a big-school state powerhouse, though their non-conference schedule got easier without Muskegon bringing a respite to one of the Lake Area’s best (certainly best-attended) rivalries. The Sailors are the Lake Area’s answer to Farmington Hills Harrison’s 2001 offensive juggernaut, with Jon Wassink playing the part of Drew Stanton. They should again get through the O-K Gold clean, but out of the league will have to really earn it early against Grand Rapids Christian — the only D to stymie South last year and winner of four straight against the Sailors — and Caledonia. Wassink has his primary weapons back and they’ll be able to score with anyone. It was the defense that ultimately caught up with them in 2013, surrendering 49 points to Marine City in the Division 4 state final. They have the horsepower for a third-straight trip to Ford Field, led by the Lake Area’s top QB, WMU commitment Wassink. He’ll play toss and catch all day with a pair of big, talented receivers Sam Heyboer and Eric VanVorst, countering with 1,000 yard back Geff Plasman. All this while operating behind a line that includes three third-year starters Mitch Quakkelaar, Casey Elzinga and Brandon Huyser. It’s high times for Mona’s program after making the playoffs for the first time, ever, last season. 2013 should see Mona fighting it out with Muskegon for the O-K Black crown. Before the league season begins, they’ll need to win three of their first four — Saline, Fruitport, Rockford, Caledonia — to justify this ranking. Like South Christian, Mona will be an aerial display thanks to an elite senior QB, in this case Buffalo-bound Tyree Jackson. With a playoff run, he could approach 100 career TDs. He has myriad weapons including an explosive junior receiver in Hunter Broesma and one of the Lake Area’s sleeper senior prospects in running back DeOntay Moffett. The Sailors aren’t just a 7-on-7 squad though. Defensive linemen like senior Zach Hellman and junior Christian Boyd. It was a great program win for Hudsonville to beat Rockford for a Division 1 regional championship in 2013. A repeat isn’t out of the question, as this is a typical Eagles team with a lot of overall side, and the bonus of Mason Opple returning at QB. He’s not just one of the best quaterbacks in the Lake Area, but one of the best flat out football players. The program’s continuity will really help in the O-K Red. Coach Dave Lidgaard is the second-longest tenured coach in the league after only hall of famer Ralph Munger at Rockford. Three O-K Red schools have first-year head coaches. The out-of-league slate is respectable but not outrageous: Holt, the long trek to Traverse City West, and Grand Rapids Christian. This ranking would seem low giving Lowell’s history, including an undefeated regular season in 2013, but there are a lot of unknowns, and a quick learning curve in the rugged O-K White which begins week 2 with an East Grand Rapids team out to prove something. West Ottawa seems often on the verge, but just can’t quite break through. It’s the same karma as the basketball team, which has never won a district. There’s enough depth and talent on the Northside to compete with anyone in the Lake Area. eniors James Lacy and Christian Rodino are a dangerous pair of running backs, and first-year QB Caleb McNitt could be WO’s answer to Mason Opple. Cal can’t be ranked any higher because the schedule is about as tough as you’ll fine. In addition to being in the thick of the Lake Area’s strongest league, the O-K White, they face they face the top two QBs, South Christian’s Jon Wassink and Mona Shores’ Tyree Jackson. Tom Burrill is back to coach the Scots and inherits a typical Caledonia roster, not big kids but athletic and tough. Seniors like linebackers Eddie Kelly and Michael Andrusiak, defensive back Logan Soule and QB Kobe Wilson are all college prospects. Here comes the other half of our theoretical college team, the top defensive players whose high school roots are in the Lake Area. West Ottawa’s own Desmond Morgan will be a four-year stalwart at linebacker for U-M.
His redshirt sophomore season was Knox’ first as a regular. He had 22 tackles (2 1/2 for loss) for Michigan State’s Big Ten and Rose Bowl championship team. He was a projected starter this season but is curretnly out with an injury. He’s moving inside for new Penn State coach James Franklin, who wants Zettel up to 285. In 2013 he played every game at defensive end, including two starts. For our theortical scheme here, we’ll use him as a 5 technique. One of Z’s two starts was against U-M, and Zettel had his lone career interception. He had four sacks and six tackles for loss as a redshirt soph. Zimmer was a high school middle linebacker at Greenville who the Bulldogs kept at home and now he’s caught the NFL’s attention as a pass-rusher. His first season starting came as a redshirt sophomore, earning Zimmer All-GLIAC honors leading Ferris with 7 1/2 sacks and 10 1/2 tackles for loss. He also returned an interception for a touchdown. He’s contributed since he was a true freshman and has started over 30 games for the Wolverines. As a junior Morgan had 79 tackles, including 4 1/2 for loss, and an interception. With Jake Ryan moving to middle linebacker, the big hitter out of West Ottawa will move back to the weakside. He’s moving to linebacker for Grand Valley after playing his first two seasons as a Lakers strong safety. Despite a broken hand, in 2013 Horling had 55 tackles while intercepting a pass and breaking up three others. A quarterback as well during his Big North days, this will be his second season starting in Marquette. As a redshirt junior, Stenz was second in tackles for NMU with 82 tackles. Stenz had two tackles for loss and a fumble recovery. His second season as a regular started quite well for Voss. He had 33 tackles, including 5 1/2 behind the line, before getting hurt in the Rockets’ seventh game. A rare Lake Area recruit for the Broncos’ previous coaching regime, the new staff is glad to have him. Had WMU won more, Currie would have been a no-contest All-MAC pick after a junior season in which he led WMU with 113 tackles (7 1/2 for loss) and interceptions with three. Currie had 98 tackles as a sophomore. Linebacker-sized safety who as a redshirt junior had 56 tackles, a sack, a forced fumble and fumble recovery. Metcalf was an all-stater on Muskegon Catholic Central’s undefeated 2008 stae championship team. He was a star on West Catholic’s 2010 state championship team who hasn’t missed a stride, as this will be Pittman’s fourth season as a Chargers’ starting cornerback. In 2013 he led Hillsdale’s defensive backfield with 42 solo tackles and 11 pass breakups. He should be one of the top cornerbacks in the GLIAC. He started a dozen games as a redshirt junior, and made four interceptions. Jones also had 53 tackles and a fumble recovery. As the high school season starts, one can’t but help and link it to the similarly approaching college season. With that in mind we look at the top Lake Area high school alumni now playing at the next level. Traverse City West grad Jake Fisher will be a third-year starting tackle for No. 4 Oregon. NFL.Com says the Ducks have the third most Draft-able team in college football. Fisher is in that mix as an athletic fourth-year senior and three-year starter. 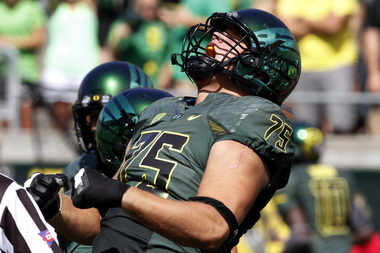 He went out to Oregon as a TC West tight end but has been a right tackle ever since. Fisher is all kinds of athlete, helping QB Marcus Mariota pile up Heisman numbers. With more consistency and better pass blocking, Fisher is first-team Pac-12 material (he was honorable mention as a sophomore and junior) and will have his named called early next April. In those same NFL.Com Draft talent rankings, MSU is No. 4 behind the aforementioned Ducks. Conklin is just another example of the Spartans staff’s ability to recruit without the distraction of star rankings and turn these “nobodies” into pros. The son of Plainwell head coach Darren Conklin, Jack signed with Michigan State in the spring of his senior year in 2012. By the fall of 2013, he was MSU’s starting right then left tackle and eventually a freshman All-American on a Rose Bowl champion. Now a redshirt sophomore down 30 pounds from last season, Conklin is on the Outland Trophy Watch List. Kruse is MSU’s first-team right guard, but for our purposes penciled in at center, a position he’s seen time at in the past. Kruse walked on in East Lansing after a state championship and two all-state seasons at Lowell. He’s been a scholarship player since the 2012 season. This right guard was Albion’s rookie of the year as a freshman in 2012. He moved to left tackle in 2013 and was first-team All-MIAA. To make this theoretically loaded lineup replete with potential pros, Ackley will move back to guard. Another lanky Rockford lineman who pulls well, Ehinger found his way onto the field in 2012 when Cincinnati’s starting right tackle was injured and started 10 games. He played both right side spots as a redshirt sophomore on Cincinnati’s 9-4 team. The redshirt senior is second on WMU’s depth chart heading into the fall. In 2013 VanTubbergen started six games before injuring his shoulder, completing 82-of-183 throws for 930 yards and four TDs. Over the last half century, few Lake Area schools have put out like Catholic Central has across generations. Hill set the CC record for single-season rushing TDs as a senior. He hasn’t been quite prolific in the MAC, but he’s certainly been good. As a junior he ran for 1,100 yards (a hefty 5.6 yards per carry) and 5 TDs. It had been a decade since an EMU runner reached the millenial lark. Over the past two seasons he’s put together 2,389 yards total offense and 13 TDs. He’ll have an NFL shot. Sharing time his first season at Ferris with another former Lake Area standout, Jamaal Jackson a senior from St. Joseph, Clark showed flashes of what made him so special at Kenowa Hills. On just 45 carries he ran for 308 yards and four TDs. He was a scoring machine for St. Francis’ back-to-back state championship teams who has transitioned to being a blocker and occasional pass catcher in Ann Arbor. 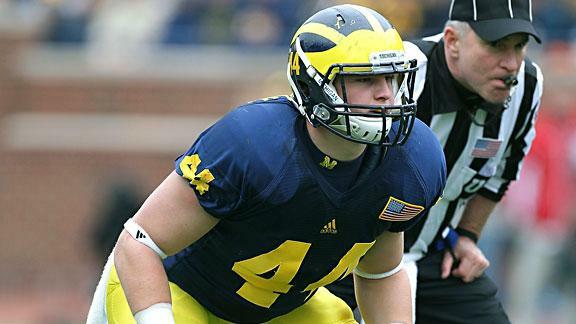 The redshirt junior started seven games for Michigan in 2013, in addition to special teams duties. Kerridge was twice named Academic All-Big Ten. This one-time Oakridge quarterback is as good an athlete as you’ll find from the Lake Area regardless of college level. Potts was as first-team Division 2 All-American as both a tight end then in baseball as an outfield for the Lakers. 2013 was the most prolific pass-catching season by a tight end in Grand Valley State history, as Potts had 54 catches for 900 yards and 11 TDs. He came from one of the Lake Area’s most pass-friendly offenses in the next town up from Hope, Grand Haven, and in 2014 will provide a veteran target for a new Flying Dutchman QB. As a sophomore Kroll had 24 catches for 338 yards and five TDs.